In the past, replacement teeth only restored the portion of the smile visible above the gum line. While these restorations complete the appearance of smiles and restore some of patients’ ability to chew and speak clearly, they do not replace the root system. Tooth roots not only provide an anchor for teeth, but they also preserve jawbone density and gum tissue volume. 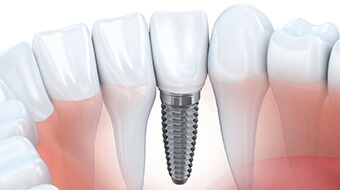 Dental implants are the only solution that replaces the entire tooth roots and crowns. If you’re interested in finding out more, please call Pelican Landing Dental to schedule a consultation appointment in our Bonita Springs dental office today. Replace the lost tooth roots, so your replacement tooth doesn’t need to rely on other surrounding teeth, gums, or bone structure for support. Instead, the self-supporting restorations function just like your healthy smile. Once in place, your implant supported replacement tooth will last for two decades or longer. Traditional dental bridges and dentures need to be replaced or repaired frequently, usually every five to ten years, to ensure proper function. Many people worry about the success of dental implants, but these long-lasting treatments have a 95% or higher success rate even after 20 years. For the more advance partial and full denture restorations, the dental implant posts create dramatically improved stability, allowing you to consume a wider variety of foods. 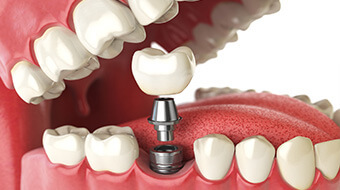 Dental implant supported tooth replacement is completed over two phases of treatment. The initial phase is the surgical placement of dental implant posts into the jawbone. The procedure itself is actually fairly simple. An incision is made in the soft tissue, and the high-quality titanium implant post is positioned in the bone. A protective cap is placed over the implant site to protect the post and shape the gum tissue in preparation for the connection of the replacement tooth. Following implant placement, patients need to wait two to five months before receiving their replacement teeth. During this time, a process known as osseointegration occurs. This is the fusion between the implant post, and the jawbone that allows the dental implant to mimic the natural function of tooth roots. Once your implant has fused with the bone, it’s time for you to return to our office where we will attach your custom crafted dental restorations. For those patients who are missing one tooth or several consecutive teeth, we will create a dental crown or fixed bridge. A single implant can be used to support one dental crown replacement tooth, and in some cases, the single implant post is able to support two crowns fused together to replace two consecutive teeth. Patients missing three or four consecutive teeth will need to have two implant posts placed. The posts will attach to either end of a fixed bridge. If you’re missing more than four consecutive teeth or nonconsecutive teeth, you may want to consider a more advanced partial denture tooth replacement prosthetic. Implant-retained partial dentures are supported by two to four dental implants, and they flawlessly fill in the gaps in patients’ smiles. We can also craft full dentures that work in much the same way as their traditional counterparts. 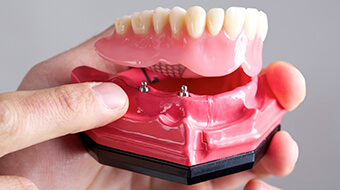 However, rather than creating suction between the gums and denture to provide support, an implant-retained denture is attached to several, precisely placed implant posts. Typically, an implant denture can be adequately supported with four to six implant posts. Number of missing teeth – the number and location of missing teeth will determine how many implants are needed and the type of restoration (crown, bridge, denture) all of which will cause fluctuation in treatment costs. Materials used – the materials used for the implants, abutments (attachment pieces), and the restorations all impact pricing. Need for preparatory services – we may need to extract damaged teeth, place tissue grafts, or perform other preparatory services that will increase the cost of care. Use of dental sedation – use of dental sedation to ensure comfort and safety during implant placement and other parts of the process may also increase pricing. Availability of dental insurance – for the most part, dental insurers do not offer coverage for the cost of dental implant posts or their placement. However, other aspects of care are covered, and we’ll do our utmost to maximize all available benefits.